Michael Schumacher is poised for a sensational return to Formula 1 with the new Mercedes team, according to BBC Sport pundit Eddie Jordan. Mercedes want the seven-time champion as their lead driver after taking over title-winning Brawn, Jordan says. "The possibility is being actively pursued and I believe it is going to happen," said Jordan. Schumacher's spokeswoman Sabine Kehm told BBC Sport a return was "highly unlikely - but never say never". The plan is for Schumacher to be a stop-gap before Mercedes can prise German rising star Sebastian Vettel out of Red Bull, Jordan said. 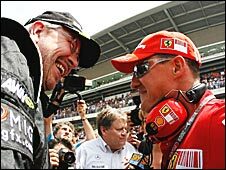 The move would reunite Schumacher with Mercedes GP team boss Ross Brawn, who masterminded all his seven titles at Benetton and Ferrari. The German, who will be 41 in January, had to pull out of a temporary comeback to F1 last year as a replacement for the injured Ferrari driver Felipe Massa because of a neck injury. But Kehm said that while Schumacher had not had any new tests on his neck, it was expected to be healed by the end of the year. Jordan said: "It started with a meeting between Michael, Ross Brawn and Daimler chief executive officer Dieter Zetsche at the Abu Dhabi Grand Prix. "At the moment, it is not possible for Michael to drive for Mercedes because he has a consultancy contract with Ferrari. "But I understand he was due to meet Ferrari president Luca di Montezemolo with a view to him being released - and that it will be approved because it is in the interests of F1. "I believe that is being planned at the moment. "I also believe Ross and Michael have spoken in recent times and that Michael likes the idea of driving a Mercedes run by Ross. It's a mouth-watering idea. "Schumacher was bitterly disappointed he didn't get to come back to replace Massa - he's keen to race again. And this is a dream for both parties. "Michael and Mercedes go way back - he drove for their sportscar team before he raced in F1, and they were responsible for getting him in to F1. They paid the then Jordan team to give him his debut in 1991. "He has won all these titles but never driven in F1 for Mercedes." The Brawn team rose out of the ashes of Honda, which quit F1 in December 2008, and won the drivers' world championship with Jenson Button in 2009, as well as the constructors' title. Mercedes's takeover was announced on Monday, but the team are looking for a lead driver following Button's decision to move to McLaren for 2010. Signing Schumacher would be an ideal way for Mercedes to head off the negative publicity that has arisen from letting the world champion slip through their fingers. A source close to Ferrari says the Italian team have yet to be asked to release Schumacher. 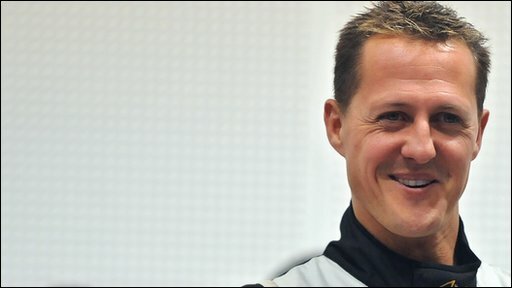 Schumacher's contract with the company was changed recently to remove him from any links with the F1 team, for which he was a consultant. He is now an ambassador, consultant and test driver for the company's road car arm. It is understood that during the summer Schumacher explored the idea of driving a third car for Ferrari on an occasional basis, but this is forbidden by F1's rules. 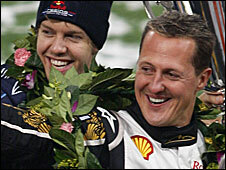 Kehm said Schumacher had given her no indication that he wanted to make a full-time return. Vettel, 22, is contracted to drive for Red Bull until the end of 2011 and, while contracts are often broken in F1, Mercedes may not find it easy to buy him out. Red Bull is owned by the soft drinks company's founder Dietrich Mateschitz who, as a billionaire, does not exactly need the money. If the Schumacher deal does not come off, fellow German Nick Heidfeld is considered most likely to get the second Mercedes seat alongside Nico Rosberg, another German, whose contract has been signed but not officially announced. But another possibility for Mercedes might be the highly rated Polish driver Robert Kubica. He has signed for Renault, but the French company is deciding whether to continue in F1, with a decision due before the end of the year. If Renault pulled out, Kubica would be on the market, and he might be an attractive option for Mercedes, who have moved to dismiss widespread claims that they are determined to sign two German drivers by describing their new F1 team as "global".